As much as everyone crosses their fingers and puts their hands together in silent prayer, not every product we dish out the dough for are winners. In fact, several seriously let us down – or at least, have let me down in the past. There is no greater feeling than finally finding that product you love, but of course it takes time, trials, frustrations and upsets. I’ve found a few doozies lately. I got this little bottle of B&B Surf Spray hair spray with my awesome Sephora’s Favourites box back in November. For quite a while it sat amongst the shelves of products; untouched and unused. And after a few tests and trails, that’s the way it stayed. It really does nothing for my hair. Maybe if you’re looking for a slight bend in otherwise pin-straight hair, this is the product for you. But if you already have curly/wavy hair, and you’re looking for something to enhance and/or define, don’t waste your money on this Bumble & Bumble product. It hasn’t turned me off B&B completely yet, so I’ll give a few more of their products a try. This one actually kinda makes me laugh. My hatred of this runs deep. I LOVE Rocky Mountain Soap Co.’s fresh and homemade soaps, but I guess in the future I’ll have to think about ingredients before I purchase. Just an FYI, real pieces of lavender in soap smells heavenly, but hurts when you rub it all over your body. These little lavender pieces are sharp, and rough, and not in a good “That feels like a massage” type of way. In an “HOLY CRAP THAT HURTS!” type of way. And DO NOT use this soap to lather before shaving your legs. Holy smokes was that a mistake. I’ve been using this one for a while, and I’m pretty sure I’ve praised it in the past. Yet since finding new primers that I love, I’ve realized that this Benefit Primer is lacking. I’ve always thought that it felt a little greasy on my face; that I’m starting off the base of my face with a greasy layer and sealing it in with my foundation on top. A friend of mine loves this product!! Like, to death. And uses it every day. It looks amazing, so I know that this product can actually deliver. But after excitingly buying my own Blackbuster, I was extremely disappointed to find that mine was dead. Like it was already all used up. A brand new one!!! I’m a sad child with a dried up marker. So sad. 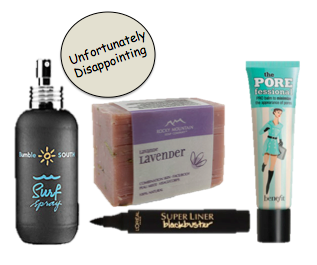 Are there any products that you’ve been disappointed with lately? Let me know.